Complete footage of the A350 XWB first flight. Airbus A350-941 F-WZGG making a VERY short field landing, arriving at Cotswold Airport (EGBP). On 2 June the first of two Early Long Flights (ELFs) that carried Airbus employee passengers and airline cabin crew. Using the no. 2 A350 XWB development aircraft (MSN002), the flight provided a realistic evaluation in typical operating conditions, including passengers' use of the in-flight entertainment system, food service and boarding. It was performed as a round-trip from Airbus' Toulouse-Blagnac headquarters airport, covering some 6,800 km. while overflying France, the Netherlands, Denmark, Norway and the UK, before returning to Toulouse. Airbus's first flyable A350 XWB test aircraft has rolled out of the main assembly building in Toulouse and into a testing hangar. The first flyable Airbus A350-XWB call sign MSN-001 was moved into the indoor ground testing station. Its a big day for the Airbus A350. 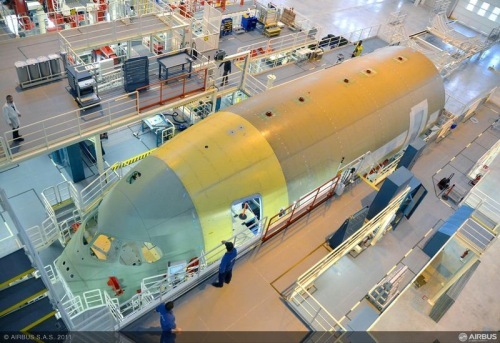 Airbus has started joining the first 21 m long front fuselage section for the A350 XWB. This phase will continue over the coming weeks, and once completed, the front fuselage will be transported to the A350 XWB Final Assembly Line in Toulouse. It will be the first major section of the A350 XWB to enter the final assembly line. The front fuselage is destined for the A350 XWB static test airframe – the first A350 XWB to be assembled. It will be followed closely by the first 'flyable' airframe for MSN1, one of the five flight test aircraft Airbus will build. The static airframe is used solely for ground tests to demonstrate the aircraft’s ability to sustain certification loads and provide key data ahead of the first flight in 2013.